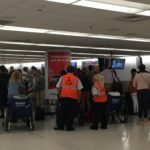 Good to read some positive reviews here but my advice is to prepare for the worst if you ever have the misfortune to go through MIA in transit. Having read some reviews here I changed my return flight to a later one as it seemed that 2 hours would not be enough to go through immigration & customs. New arrangements provided for 4.5 hours. Well I'm glad I did. After a 15 minute run from the plane I joined a queue at immigration at 5.45pm and was finally granted permission to enter the USA at 7.30pm. Some people in my queue and those adjacent were pulled for questioning by officials after queuing already for an hour or more. Guess they didn't make their connections. The baggage bit was hopeless - despite being told that I would have to collect my bag and go through customs to clear it and recheck it it wasn't on the carousel (no signs telling you what carousel to go to - you just have to wander up and down and hope you can spot your flight). Piles of bags everywhere - some of them were from flights which had landed several hours earlier. The concept of customer service is clearly non-existent in staff at this airport: to get help I had to break up conversations between staff who would have quote happily chatted indefinitely looking at pictures on their mobile phones flirting with each other etc. if I hadn't forced my way into their conversation. Turns out that despite what my Air Jamaica people were told in JA my bag was checked through already (apparently) though the staff at my departure gate denied this. I did have to check in again at Departures and eventually arrived at my gate at 9pm for a 9.30 flight. Concourse E - dismal place rubbish facilities (hot dogs and a tiny Pizza Hut concession - and that's about it). My bag did reappear in London. I dislike Heathrow and UK airports in general but it seemed like a paradise of good signage helpful staff and logical transit arrangements by comparison. If I can avoid it I will never go to MIA again nor will I book flights requiring a transit at a US airport - nearly missed my connection on the way out at JFK because of a 50 minute wait for baggage and being misadvised about transfer of luggage to next flight from different terminal. But that's another story. The new terminals are exceptionally attractive organized and comfortable. If checking in with a pre-printed boarding pass and carry-on only I can make it from curbside to gate in under 30 minutes for domestic flights. 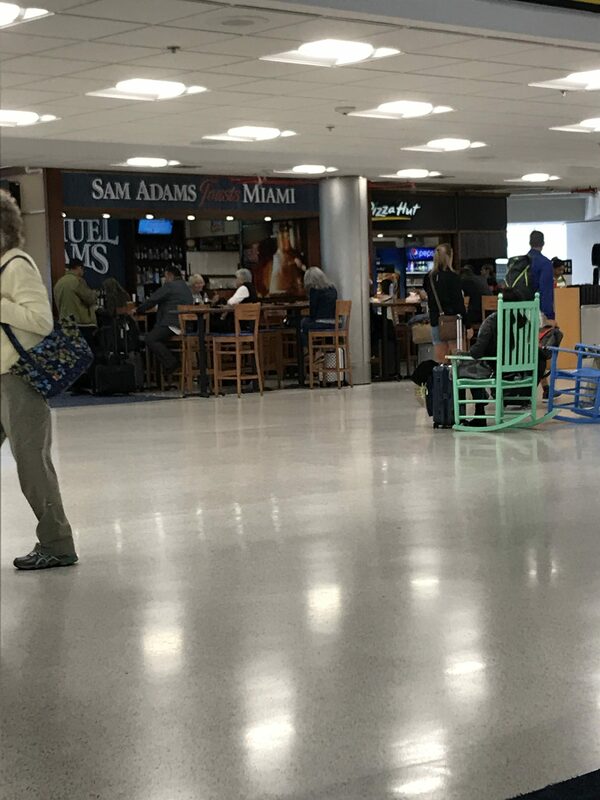 The food options in the airport are good and service is generally above- average for Miami. 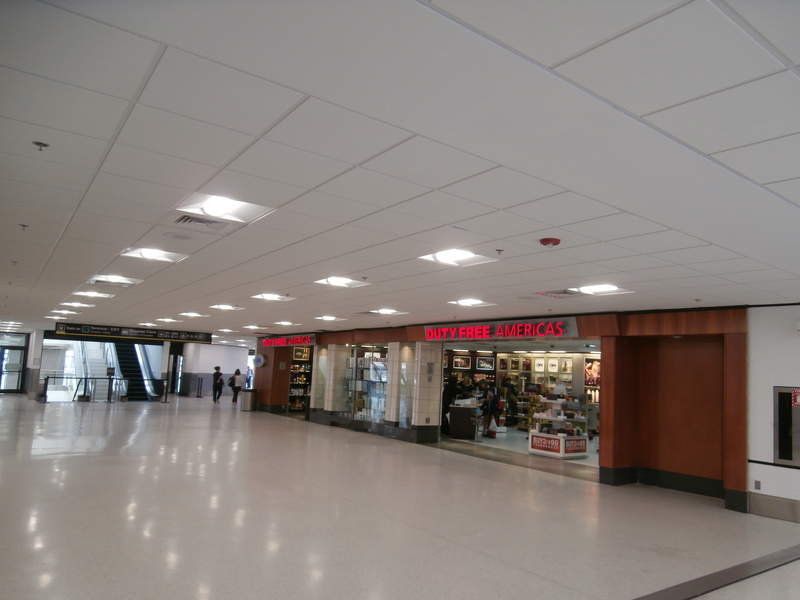 Even though the new E terminal is modern and spacious the rest of the airport falls behind. Arrivals area for international flights at D is shabby looking cramped confusing. Transferring between flights as noted by another reader is a joke. To recheck a bag one must leave the secure area follow some a path of yellow dots which lead only back to the terminal. Signage is unclear confusing. There's no intra-terminal TSA clearance like other major airport. It seems the airport has gotten better from a few years ago when I was there last but my biggest pet peeve about MIA is that the airport official language is Spanish not English. I was given directions several by airport staff in Spanish! Good but not great airport. It was spacious and clean though signage to our terminal was a bit tricky. Security check was not an issue. I was in the LTU/Air Berlin terminal and they only had a sandwich stand and newspaper shop after security which was very disappointing. Also upon arrival from Germany it was a long walk to passport control and they only had customs reports in Spanish! From my recent knowledge Miami is still part of the USA. It wasn't a perfect experience but I would have no big worries about using MIA again. Decent variety of shops and restaurants though better outside of security than inside. Various terminals not all linked so to get from one flight to another you may well have to exit the secure area walk a ways and then go back through another security line (similar to many other airports; need to keep this in mind when calculating transit times). Terminal J still in the process of being finished so fewer choices for dining and shopping than in some other areas (you can get to Terminal H without exiting security). One nice thing about MIA is the number of hotels near the airport. Even one inside the terminal itself though it is not cheap and the rooms are rather small. 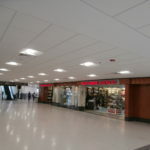 Car rental agencies are located a ways from the airport terminal. As with my most recent posting on LHR I have to speak as I find and MIA on 2 April was a good experience. It is a long walk from the gate (BA) to immigration but ours was the only flight and we were processed in five minutes. Officials were marshalling excess visitors into residents booths and keeping the whole thing moving. Surroundings were light and airy and fairly clean. They have introduced the ten digit scan but it was not unduly time consuming. My immigration official was pleasant. Baggage was fairly swift. The high outside temperatures seep into many parts of the building. The Alamo shuttle staff were very friendly. Alamo itself was a bit of a let down as there was a problem with our reservation and no easy access to baggage carts. Being frequent travellers through London Heathrow we thought we were prepared for anything until we had the misfortune to transit twice through Miami. After stepping off the plane into a rundown facility we then had a seemingly endless walk through a series of white-washed corridors only to emerge at the other end and be greeted with queues of hundreds of people and their baggage trollies spread across the whole of the concourse. The departure area for our continuing flight was equally unpleasant as it seemed we were leaving from the teminal that time forgot the 1960's decor not in the least bit updated. Our return trip was probably worse already delayed by an hour immigration into the USA took over an hour (compared with other US airports where we have been through in less than 10 minutes). We then had to encounter another security queue. Unfortunately we were going through at a busy period with a number of international flights leaving at the same time. Nevertheless the second TSA officer disappeared leaving one person to deal with the ever lengthening queue. Concerned at missing our flight we asked about the possibility of a quicker route through only to be bluntly told "you have plenty of time". Clearly this was not the case as we arrived at our gate as the boarding for our flight was well underway. Every time I visit Miami I have to wait over two hours to clear immigration as it is a free for all when you enter this department. I have been to Chicago O'Hare twice and each time it took less than half an hour. Perhaps the MIA staff should look at the O'Hare operation and see where they can improve. I recently had to do a trip via Miami (not staying there just in transit). I had 2.5 hour transfer time - had to wait 2hrs to get through passport control alone. 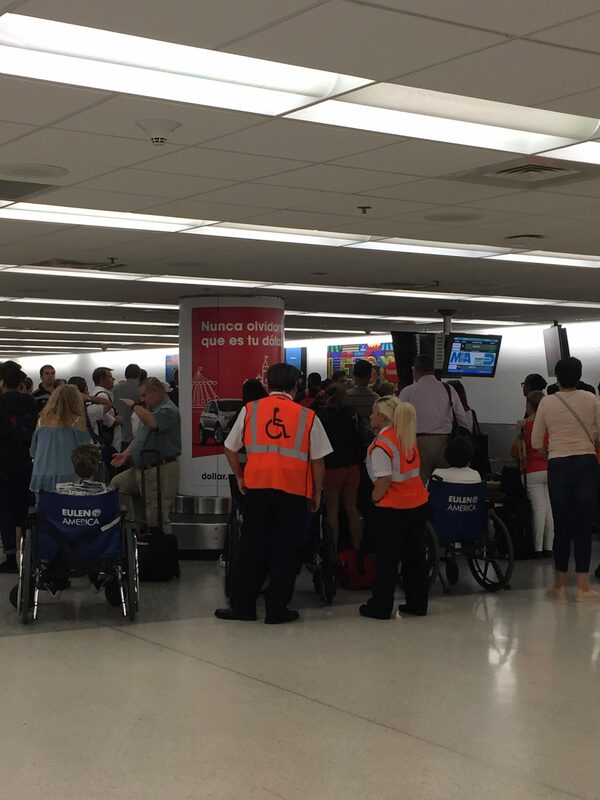 There were about 20 people in front of me when clearing passport control I had to collect my hold luggage because Miami airport have a policy of not allowing baggage on connecting flights then I had to re-enter it into the system and I had a connecting flight. If you have a section for American residents and a section for Visitors why not do a section for people in transit who have connecting flights within 2 hours. 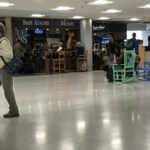 Sorry if this insults the people in charge of the running of Miami airport but it really would help with the frustration of some of your passengers who are not entering the USA but on a connecting flight! It seems to work everywhere else in the world? When I came with my bag to the desk for my connecting flight I was asked why I was so late - can you imagine my frustration knowing I'd landed 2 and a half hours before and being asked why I'm late !? Get it right Miami!